Napa Valley Restaurant Week provides both visitors and residents with an added incentive to experience a new restaurant or revisit a favorite. The weeklong promotion, Jan. 22 – 29, 2017, offers diners a choice of a two-course lunch for $20 per person, or a three-course dinner for $36 or $46 per person. Each chef has created menus to celebrate the season and many of the restaurants offer optional wine pairings at an additional cost. Below are some highlights of Napa Valley Restaurant Week, most of which are recipients of the Napa Valley Vintners Restaurant Wine List Awards, which recognizes Napa Valley restaurants that feature Napa Valley wines in the majority of their wine list. To view the complete list of restaurants participating in Napa Valley Restaurant Week, visit VisitNapaValley.com/RestaurantWeek. Basalt offers a $36 three-course dinner menu with an additional $15 optional wine pairing. The three-course menu features a choice of roasted baby beets with Quinoa, Mandarins, goat cheese croquette; or crispy duck confit with Fuyu persimmons, Pink Lady apples, and chicories; followed by bacon pork tenderloin with braised savoy cabbage, grilled carrots, and Kraut; or local Petrale sole with rutabaga, pickled cranberries, pistachio brown butter; finished with a warm pearl galette with candied walnuts, vanilla bean ice cream. The Boon Fly Cafe at the Carneros Inn offers a $36 three-course dinner menu featuring County Line chicories with candied walnuts, winter citrus, brown butter vinaigrette and smoked Vella Dry Jack; braised beef short rib with Riso de Polenta, winter squash chow chow, onion straws and natural jus; and Sticky Toffee Pudding with butterscotch sauce and Bourbon vanilla ice cream. Carneros region wine pairings are available at an additional cost. Ca’ Momi Osteria offers a $20 lunch featuring a selection from their list of calzoncino and battilocchio, insalata misticanza, and panna cotta al caramello; and a $36 dinner, including any item from their selection of primi courses; a side from the contorni menu and panna cotta al caramello for dessert. During Napa Valley Restaurant Week, guests may add a glass of Rosso di Ca&apos; Momi or Bianco di Ca&apos; Momi for $5. Galpao Gaucho Brazilian steakhouse offers an unlimited menu featuring an extensive salad bar with more than 40 items and 17 different cuts of meat ranging from beef, pork chicken, lamb and fish for $46. Siena Restaurant at The Meritage Resort and Spa offers a $36 three-course dinner special including a variety of selections from their menu. Diners may choose from small plates such as shaved Brussel sprouts, and pumpkin risotto; large plates such as Short Rib Tagliatelle or Mount Lassen Trout; followed by desserts including Tiramisu or a Huckleberry and Blueberry Linzer tart. The Grill at Silverado Resort and Spa offers Chef Pablo’s signature “Pollo Loco Special.” The three-course dinner is $36 per person and features a classic wedge salad; Chef Pablo&apos;s Pollo Loco half-chicken with corn grits; cheese stuffed Anaheim chili; and Mud Pie with Oreo crust for dessert. Tarla Mediterranean Grill features a $46 three-course dinner, including a glass of wine. Optional wine pairing is available. TORC’s Chef Sean O’Toole offers a three-course dinner menu for $46 per person. Wine pairings are also available for an additional charge. Gather Cafe at Stewart Cellars features a choice of two three-course lunch specials for $20 per person. The first includes roasted baby beets and citrus with goat cheese, arugula and pistachio vinaigrette; parsnip bisque with fennel pollen and toasted brioche; and orange cream custard with cranberry and pecan; or sourdough toast with butternut squash, bacon and aged Cheddar; short rib stew with winter vegetables; and dark chocolate mousse with hazelnut praline. Lucy Restaurant & Bar, located within the Bardessono Resort, offers a two-course lunch for $20 per person. Mustards Grill offers a $20 two-course lunch which will change daily and feature pasta with a salad or soup; or a sandwich with dessert. Also featured will be a $36 dinner special with an ever-changing selection of signature entrees offered with soup or salad and dessert. Executive Chef Robert Curry presents a two course “Weekday Michelin Star Lunch” for $20 at The Restaurant at Auberge du Soleil, Jan. 23 – 27, 2017. Chef Hiro Sone at Bar Terra offers a $36 dinner special, featuring a changing menu of Bar Terra specials, fit for Cabernet Season. Wine pairings will also be available. Brasswood Bar & Kitchen offers a $46 four-course dinner, which includes fresh mozzarella; a signature salad; house-made pasta; and choice of dessert. Wine pairings are available for an additional fee. Cindy’s Backstreet Kitchen offers a $20 lunch and $36 dinner menu with an optional Napa Valley wine flight at an additional charge. Goose & Gander offers a $20 two-course lunch featuring the Martini House mushroom soup or baby lettuce salad, and a signature sandwich or G&G Burger (hash and eggs or a breakfast sandwich during Sunday Brunch); and a $46 three-course dinner featuring the Martini House mushroom soup or baby lettuce salad; choice of Mary&apos;s organic chicken breast, Passmore Ranch sturgeon, or grilled NY steak frites, followed by a seasonal dessert. 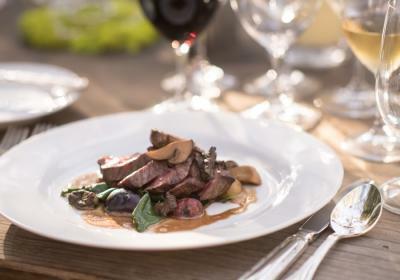 A wine pairing is available for dinner from a local Napa Valley winery for $36. Harvest Table offers a two-course lunch for $20 and a three-course dinner for $36, with wine pairings available with dinner. Market Restaurant offers a lunch special of the soup of the day and fried chicken for $20, and a dinner special featuring crab cakes; pan-sautéed chicken breast; and butterscotch pudding for $46. Brannan’s Grill offers a two-course lunch for $20 with choice of Cobb salad; a tri-tip sandwich; or a burger, and dessert, as well as a three-course dinner for $36, which includes a house salad, and choice of roast chicken; Cioppino; or smoked short rib; and dessert.